Wolfville, NS (September 18, 2018) – Devour! 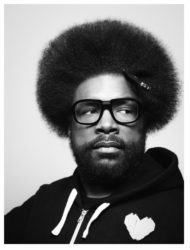 The Food Film Fest announces the addition of musician and culinary entrepreneur Questlove (The Tonight Show Starring Jimmy Fallon Musical Director and leader of the show’s house band, influential hip-hop group The Roots) to the programming lineup for the eighth annual instalment, taking place October 23 – 28, 2018 in Wolfville and Kings County, Nova Scotia. Questlove will join 2018 Festival Co-Host Ali Hassan (comedian, chef and CBC Host) onstage for an intimate conversation about food issues, culinary creativity and his infamous Food Salons. Following the live interview, the New York Times best-selling author will meet festival-goers for a book signing. As a drummer, DJ, producer and five-time GRAMMY Award-winning musician, Questlove’s name is synonymous with music, but the artist and activist is also an influential figure in the culinary world. He first arrived on the food scene with his signature “Love’s Drumstick,” his Creole-seasoned, buttermilk fried chicken drumsticks. He appeared as a Guest Judge on Top Chef Season 11 and currently hosts a series of Food Salons with world-renowned and innovative chefs at his Financial District apartment in the NY by Gehry building. His book, Something to Food About explores creativity in cooking with ten of America’s most innovative chefs. His culinary endeavors have been featured on the cover of New York Magazine, in Food & Wine Magazine, Bon Appetit, and seen on The View, Watch What Happens Live, and Late Night with Jimmy Fallon. Questlove is equally as passionate about food politics, a natural fit for the 2018 Festival theme “The Power of Food and Film to Transform”. He is a Celebrity Ambassador for Food Bank For New York City, is on the City Harvest Food Council, a board member of Edible Schoolyard, and the first Artist-in-Residence at the Made in NY Media Center. Questlove is also a Founding Member of the CAPA Foundation in Philadelphia. A Conversation about Food w/Questlove & Book Signing takes place Saturday, Oct. 27 at 3pm at the Al Whittle Theatre, 450 Main Street. Tickets are on sale now for $25.